Discussions about the free plans distributed at bateau.com and BoatPlans-OnLine.com. 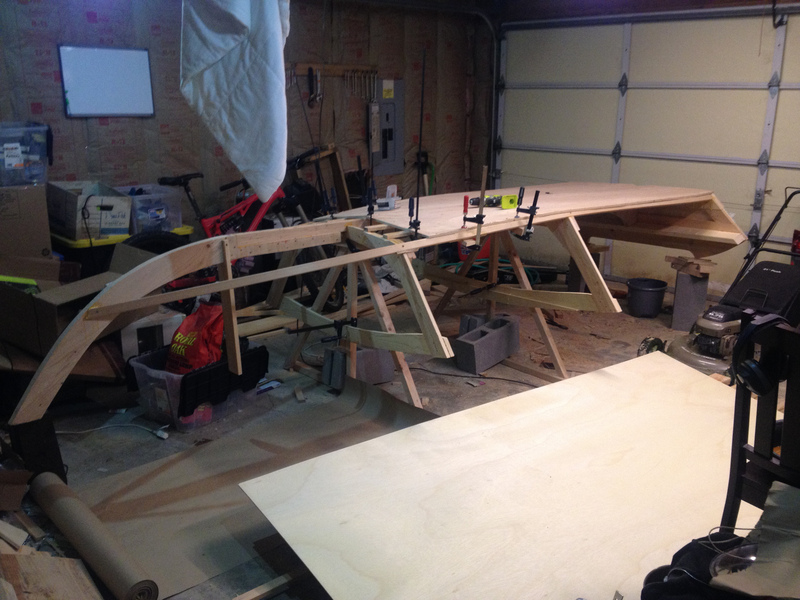 This is a build log of my first boat. I have been looking around and decided the PM38 would be an easy enough boat to tackle and be functional at the same time. 1. To be lightweight so that my SO and I can easily launch and retrieve the boat. 2. To be light enough to allow my 240sx to tow it so trailer and boat must weigh < 800lbs with less than 200lbs straight on the hitch. 4. Be simple enough and robust enough that I can build it with horrid wood skills. Seems the the PM38 matched all, well I mean most, of those. A few days into the build I had built the frames #2 and #4 and confirmed with myself that I was capable of constructing square and rigid shapes. This was my mental sanity check. If I could not build these frames I was going to stop while I was only ~100$ into things. Sadly I constructed them with less than 1/32" variance. 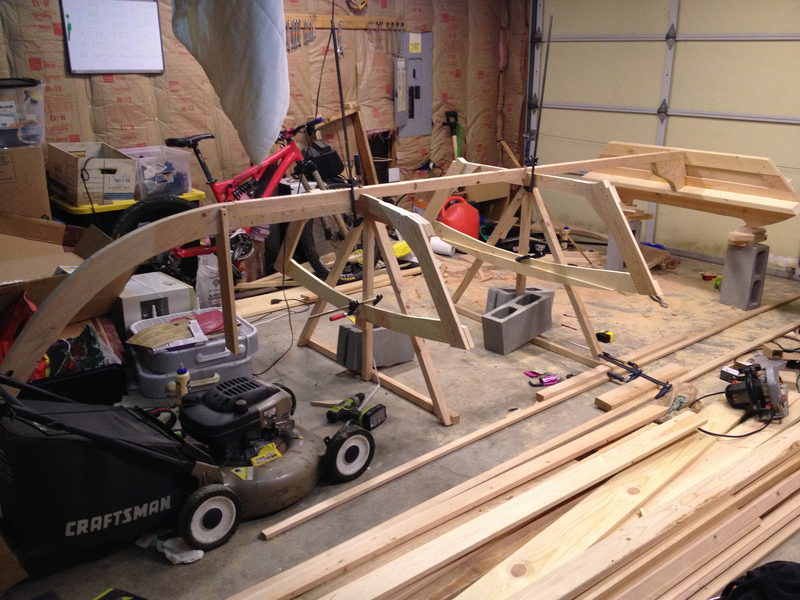 The Keelson, Transom, and Bent bit (unknown) at the front were glued and screwed together and brought into the garage. Attaching the frames to the keelson was a difficult process, I spent almost an entire day moving things slightly and re-clamping. But I got everything straight and level as I could. The frames were glued and screwed into the keelson. Here is where I noticed that the 2x4 I had selected for the keelson had a knot in it ~1/3 from the transom forward. I have yet to fix this but I am planning on taking some 1/2" ply and screwing it to the sides like where the keelson and the Bent bit (unknown name) connect at the front just for safety sake. Up until this point I have still been very unsure of the rigidity of the whole project. Too much weight anywhere and the whole frame would walk and have to be re-aligned. But as I started adding the bottom battens I was impressed by the quick gains in rigidity throughout the entire frame. Some mistakes were made. I was unsure the size of my battens as I have been buying wood on a day per day basis. When I built the transom out I was unable to cut the notches into it for the battens to sit. I was able to use my jigsaw and a flat head screwdriver to notch out places for the chine logs but bent and broke 4 blades in the process. I didnt want to continue doing that and just screwed them flush into the transom. The strength of them in this configuration worried me. I added 1/4" ply to each batten that lapped up onto the bottom of the transom by 1 1/2" and glued it all together. I believe the strength is okay here. Some issues I also ran into. 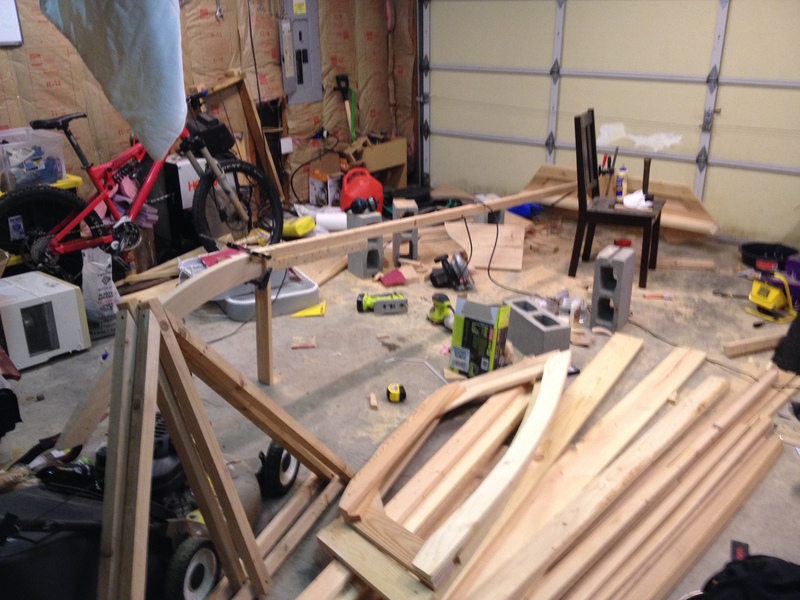 I am having a difficult time sourcing lumber in lengths > 12 feet that are knot free. The plans call for 16" lengths for the chine logs. I took a 10' and a 8' length and cut at a wide angle to create a joint 6-10" long and let them dry overnight. The first goal was to bend the chine logs into the bent front section (unknown name). As I was doing this I used a soaked towel and a iron to steam the wood into shape. As I was working on gluing and screwing the end in my joint snapped! I removed both of the chine logs, sanded down where the glue was, cut out backing plates from the 2x1" material that extended > 4" on each side of the joint. Glued and clamped those together waited 24 hours re-attached the chine logs. This time around I was very slow and spent 15-20 minutes per log with the towel and steam making sure it was penetrated well and it became quite flexable. I was able to glue and screw the chine logs into the front of the boat. 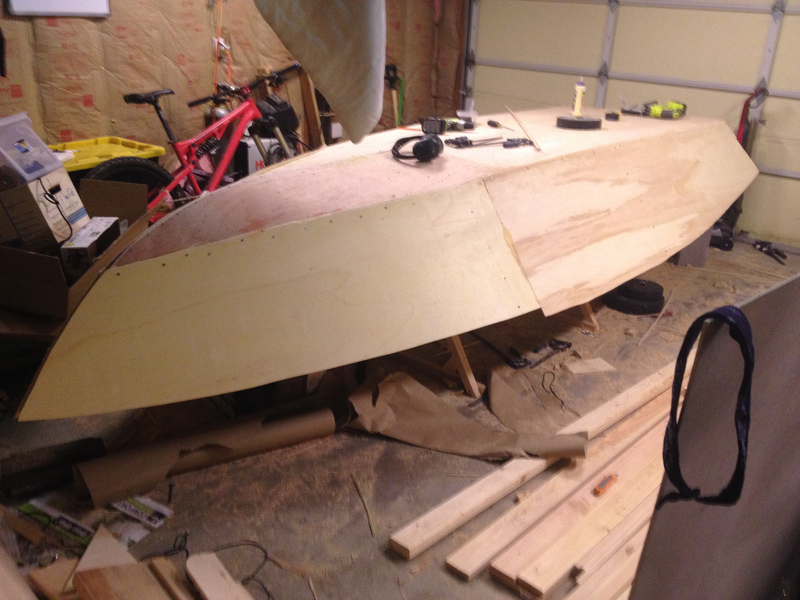 While that was gluing I cut out the bottom of the boat from 1/2" ply. The plans call for 3/8ths but it was not readily avaliable in my area. With the odd issues with the transom and battens and the keelson knot I figued id rather go larger than spec than below. Now the frame is very rigid, I could actually imagine standing in the boat without breaking it. Continued planking the bottom of the hull. With 1/4 ply. This actually has me a bit worried. I was able to get them to flex into position no cracking or major issues but when its glued down there is a bit of flex in the center of the ply. The future plans have frame #1 going in the middle there but it generally only supports the sides. I know not much weight will ever be up there in the hull but I dont want to hit a huge wave at the right angle and have the wood snap. I am still debating creating a lower beam out of some extra 1x4" wood to re-enfoce that plywood in place with frame #1. The next large process was continuing the planking with the sides. The but joint lays up right behind frame #2 by about 6" where the flex from the shape is the least. It has 1/4" plywood 4" wide backing it. Waited for the glue to dry before fitting and making final trimming adjustments. The sides have been glued onto the frame and screwed down. I am waiting on the fiberglass + epoxy. The plan forward is to work on frames #1 and #3, I can get them in the boat and then flip it back over whenever the epoxy shows up. 1. I ordered 1.3oz fiberglass weave, enough to cover the seams + the entire underside of the hull up to the spray rails. Is this too thin? I have never worked with fiberglass before. The plans dont call for it structually. But I would feel more safe with a bit more rigidity especially on the 1/4" ply sections under the nose. 2. The knot in the keelson. Will screwing and gluing 1/2" plywood be enough to make this not break. The engine will I assume be putting a lot of stress on that area of the construction. 3. Size of the engine. I am looking in the 25hp range right now and hope that it will be enough to go ~30mph with me 200lbs + 120lbs So + 50lbs of stuff? Blackley, what is that boat? It is not one of our designs. On this forum, we discus the building of boats from the boat plans we sell at bateau.com or boats built with materials from BoatBuilderCentral.com. It looks like a boat built from free plans from Popular Mechanics. I may have to start a new section for that. I am not opposed discussing the building of those but will only offer support if the builder uses our materials. Done -> moved to the Free Plans section. Nice boat BTW, if somebody wants "improved" plans for it with lofting and developed panels, I can do that for a reasonable fee. I was directed here by a user (Dizchord) from some questions I had on reddit. Figured I should put a build log somewhere and this place looked active and inviting. Thanks for creating a subform! Looking over the plans it shows its supposed to be 13' long. But Im looking at ~16' long from the longest points. How are boats generally measured or did I screw up somewhere and make a boat 3' longer than it should have been? OK, switching to tech. support mode. This build is a good example of how complicated plywood on frame can be compared to our method: framing with bevels, delicate set up, steaming, difficult to find wood etc. That will not add any significant strength to the bottom. ideally, you should have one layer of glass inside and one outside, a sandwich panel, but you can't with that type of construction. Therefore, we must build strength with the outside skin which is not as efficient and more costly because we need more glass. With a 25 HP, I would go for at least one layer of 6 oz. woven but taht will not get you to 25 mph. For a 25 mph boat, add one layer of 12 oz. biaxial in epoxy. For anything above 30, either 2 layers of 12 oz. biaxial or one layer 1708 in epoxy. I would go for the 1708. That's where epoxy-fiberglass is superior for a keel but since you have it, I would sister that part, between the frames, between one layer plywood each side, in epoxy. Another solution is to tab the keelson to the bottom panels with 2 layers tape each side, full length but 4 layers where you have the knot. Biaxial tape 12 oz. in epoxy on putty fillets. Strong, light, easy to do. Not unless you keep everything very light. let's use the Crouch formula. Boat weight 500 lbs, engine and battery 150, fuel 60, crew and gear 500 = 1200 lbs about. With a 25 in PERFECT condition, flat water, WOT, you get 27 mph. Things are not always perfect and you don't run an engine WOT all the time. And you may end up with a heavier boat or crew. And 150 lbs for a 25 HP and battery is not much. With a 50 top speed will be 38 mph but a 50HP at 1500 lbs displacement = top 35, cruise between 25 and 30. I"l aim for a 50 HP. If you keep the boat and crew all very light, the 25 or something in between will be fine. The plans say hull = 200 lbs but I don't think it is possible. TomW, feel free to interject, you are knowledgeable in that area. Why not? You are doing a nice building job, she will be tight with fiberglass up to above the waterline. Use epoxy for all glued seams and she will be tight. blackley1 wrote: I was directed here by a user (Dizchord) from some questions I had on reddit. I think I know that user . . . he is a trouble maker but a nice one. The sub forum exist since 4 years but few people use it, welcome. Some boats are named after their waterline width: it is probably 13 at the waterline and 16 LOA. I think the curved piece at the bow is called a stem. Ok I know this is an old post but I really need help. I am starting this very same build, however I am having such a hard time creating the frames. I tried to draw out the patterns but I failed. Frame one has two triangles on either side in the drawing but yours do not. That is very confusing. The drawing do not show the deminision of the angles on the side of the frames either. Any help would be appreciated. Please. I am not sure how much help you will get here as I do not know if any of us know about what you are building. It is not that we do not want to help but I for one can not answer your questions. Maybe if you could post some pictures or more information one of the guys will chime in. I would help if it was one of my designs. My plans are very easy to read but I have seen some others that are impossible to decipher. Your question about the angle seems to be about the bevel of the molds/frames. There is no bevel in my designs but in your case, you either must loft full size or work on the molds with a fairing batten and bevel that way. Check some wooden boat building books like Steward. Sorry.